Save 20% storewide! That's right, fellow vapers! 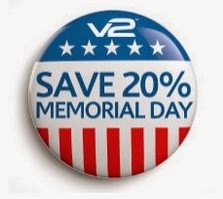 V2 Cigs is running a big Memorial Day sale right now. Get 20% Off everything they offer on the website! The sale starts on May 23rd and ends on May 25th. During this sale you can save on e-liquid, vape pens, starter kits, e-cig batteries, etc. Basically, anything and everything! To get your 20% off vape sale savings, just go to the V2 Cigs website here.